It’s times like these I’m thankful I have no fear of heights, for there’s no place for the vertigo-prone on the 35th floor of the Mandarin Oriental New York. 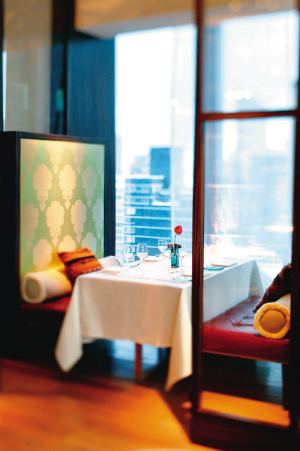 Our final rendezvous with the city that never sleeps – as we bring to a close a 10-day visit – is at Asiate, the luxury hotel’s restaurant that promises contemporary American and Asian fusion cuisine. 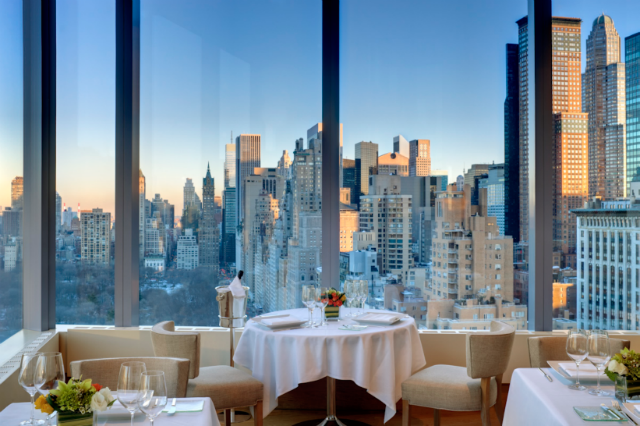 Our table’s lofty setting, next to sweeping floor-to-ceiling windows, grants us ‘front row seats’ to views over lower Central Park, Columbus Circle and the jagged Midtown skyline. A dainty amuse-bouche accompanies our aperitif of Ayala Rosé Majeur champagne; a serving of foie gras with shaved truffles and apple gelée, which has the goods to be a crowd pleaser even if the prized funghi’s flavour is so subtle it barely registers. Dipping into the bread basket, the French baguette can’t yet compete with the fresh-out-of-the-oven delights from my local Parisian boulangerie (not fluffy or salty enough on the inside and a crucial crusty factor missing from the outside). But we needn’t have worried; despite a shaky start the meal steadily hits its stride, our specially prepared menu unveiling an abundance of fresh and creative flavours, a pleasant surprise revealed with every course. The colourful hamachi sashimi dish with green soy ponzu, white tapioca and preserved cherry blossom is refined, however a flute of the Sparkling Pointe Brut Seduction is somewhat disappointing following the standard set by the bubbles served earlier. 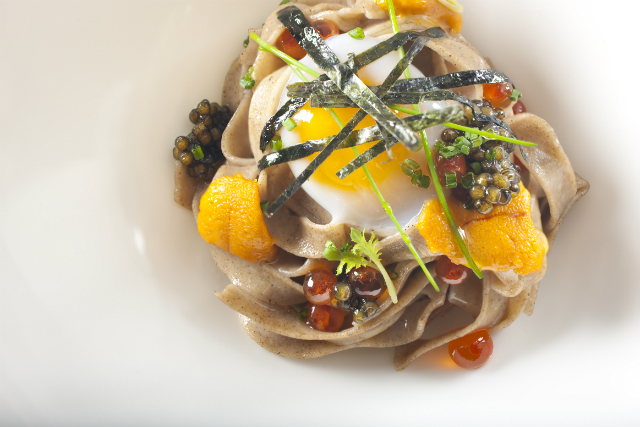 The second offering, “Buckwheat and Eggs” – soba noodles topped with Ossetra caviar and a tiny dollop of uni cream – is rich and delicate all at once and pairs nicely with a few sips of Shirataki Sara Wind Junmai sake. Chef Angie Berry and her team hit a high note with the diver scallop, wonderful alongside the crispy crunch of caramelised celery and the palate-cleansing freshness of green apple ice. The subtle but skillful play on tastes and textures continues with a sweet and savoury creation of Atlantic halibut, surf clam, pickled cabbage purée and citrus sabayon. The marine theme continues with a well-balanced dish of butter-poached lobster, white polenta, succulent mushrooms and a kaffir lime emulsion that is both creamy and tangy. A grade 7 wagyu beef tenderloin, whose soft pink flesh does well to satisfy our carnivore cravings, is just right with a smattering of tomato chutney, smoked potato purée and yuzu kosho. 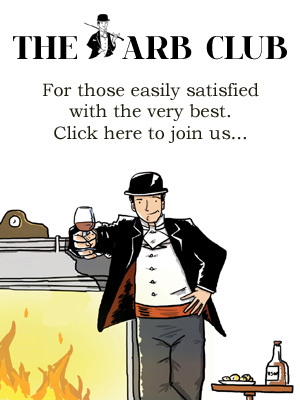 We wash it all down with a generous pouring of Château Tour de Pressac, before preparing for the final act of the evening. A symphony of delicious desserts concludes our Asiate experience; mini portions of chocolate caramel torte and moreish maple gelato, blood orange panna cotta, mango pistachio gateau and a refreshing calamansi soda with lychee sorbet propel us to sweet tooth paradise. But whether in foodie heaven, or 35 floors above ground – or both, we have to come back down to Earth eventually, but not before lingering over coffee and petits-fours as we gaze over the city, wishing that our Big Apple adventure didn’t have to end so soon. Asiate at the Mandarin Oriental New York, 80 Columbus Circle at 60th Street, New York City, 10023. Tel: +1 (212) 805 8881. For more information and reservations, visit the website.